Today's luthiers have at their disposal a bewildering array of tools and jigs to perform measurements of their instruments whilst under construction and during set-up. 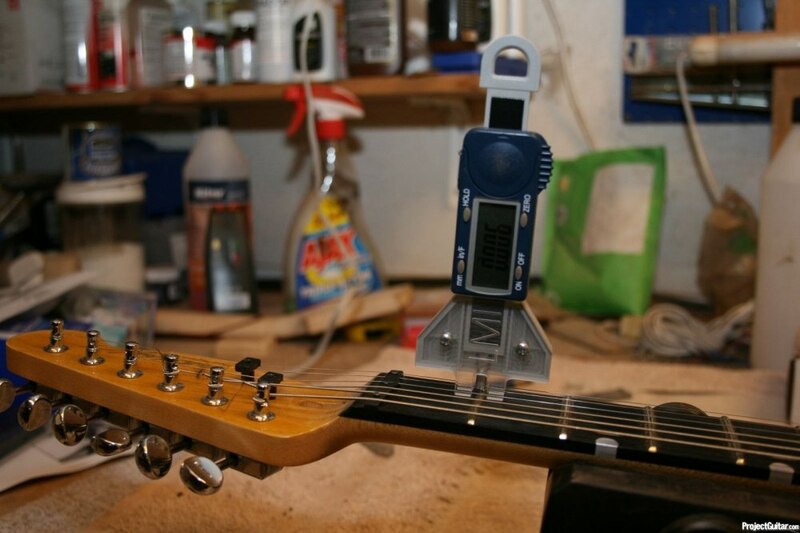 One such tool that has been developed in recent years to help simplify the process of setting up a guitar is a Nut Slot Depth Gauge or String Height Gauge. These tools enable a more accurate and direct measurement of the string height over the first fret by providing a real-time readout of the distance. Traditionally the string height is checked by depressing the string at the third fret and checking the distance between the string and the first fret. With a Nut Slotting Gauge the string height over the fretboard at the first fret is first measured. The string is then depressed on both sides of the first fret, and the two measurements are compared. By subtracting the fret height and the string thickness you get the exact height of the string over the first fret. In reality this is often done by zeroing the tool in one of the two positions - string depressed or string released. While constantly checking those measurements during the nut slotting process the user can dial in the string height to an accuracy of one hundredth of an inch. For several years the only commercially-available tool was the Nut Slotting Gauge by Stewart-MacDonald, based on a mechanical readout dial. A fresh newcomer has entered the market in the form of the Digital String Height Gauge by Luthiers Mercantile International Inc. This tool performs the same function as the Stewmac Nut Slotting Gauge, but is based on a digital caliper mechanism adapted for measuring the height of the strings over the first fret. Recently I had the opportunity to try out the LMI Digital Gauge and compare it to the well-established Stewmac unit during some set-up work. The LMI unit is made of plastic and is much lighter compared to the Stewmac tool, the latter being of metal construction with a heavy brass base. Don't let the light weight of the LMI gauge fool you though; in use it still gives the Stewmac version a run for its money. I have now used it on quite a few new nuts and setups on older instruments and it works exactly as it should. As the LMI unit lacks the brass base it is sometimes a little hard to balance the tool when measuring the outer E-strings, but with a bit of practice that can easily be overcome. In that area the Stewmac unit performed much better with its wider and heavier base, allowing it to stand freely without toppling over. On the other hand, the lack of a wide base that straddles several strings simultaneously means that the LMI unit is much more flexible in terms of usage with odd string spreads (for example, on bass guitars). One possibly-unforeseen disadvantage to the Stewmac tool's heavier base is that it is far more likely to cause scratches or dents if knocked over or dropped onto the instrument. The LMI tool being purely a manual hand tool will never be left on an instrument unchecked. Zeroing the Stewmac gauge to start performing string height measurements is accomplished by lowering the mechanical plunger until it just contacts the top of the string and then rotating the dial until the pointer indicates "0". 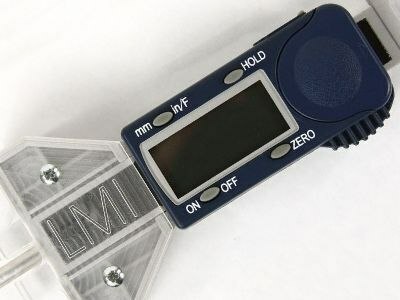 The LMI tool zeroing function is much simpler in that the tool is placed on the string and then the "Zero" button is depressed. In practice I found it much simpler, and more exact to reverse the ”measure/reset” routine suggested in the tools' documentation. I lightly depress the plunger so that the string rests on the fret and zero it in that position. By doing so the measurement will be a displayed as a negative number when the string pushes the plunger back up after being released. After the first zeroing I can put the gauge away and work on the nut slot. When I want to measure again, I don't need to reset the gauge. 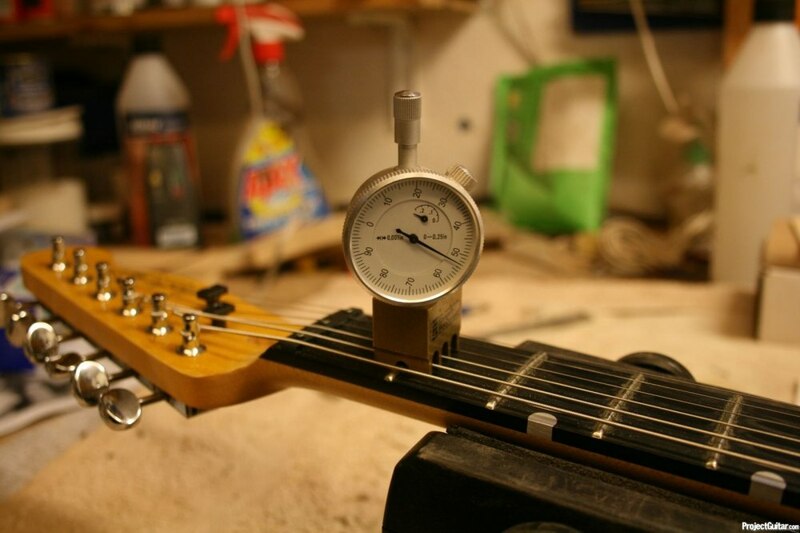 Instead I just place the gauge over the fret, rest the plunger against the string and read the string height instantly on the display. And it is much more accurate to zero the tool against the fret/string rather than on the flexing string suspended in free air. Both tools perform equally well in this regard, with the LMI gauge having the edge over the Stewmac version in terms of ease-of-use. Having a tool like this will make your set-up jobs more accurate and most of all, consistent and more repeatable. If you take notes on your setups you can very easily duplicate the results on several instruments at once. Very useful for technicians working on more than one of a client's instruments. The LMI tool works well on both guitars and basses equally, and with a variety of string spacings or multiple course instruments such as 12-strings. The Stewmac version has a base that spans three strings keeping it more stable, but disqualifying it for use with instruments featuring wide string spacings. 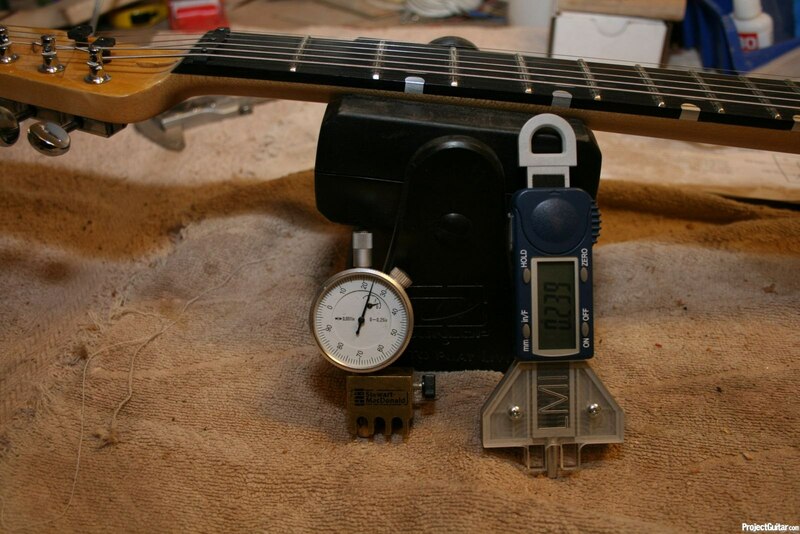 Stewmac however do offer a Nut Slotting Gauge with a different base for use with bass guitars at an additional cost. In my shootout between the Stewmac and the LMI gauges I found the latter to be faster and easier to use overall. The base of the tool is much more flexible when it comes to string spread and gauges. The Stewmac tool wins in terms of being more stable when measuring the outer strings (extra points awarded as it will never run out of battery power). Under heavy use in a workshop I am concerned that the plastic parts of the LMI unit might not survive as well as the Stewmac version, however I have not had the tool long enough to be able to make any definitive conclusions about that quality of its construction. In general a guitar workshop is not a hectic workplace so these types of tools should not be subject to excessive wear and tear. If we look at the monetary side of things the LMI gauge is a sure winner at about 75% the price of the Stewmac version. Additionally you would have to purchase two gauges from Stewmac to work on do both guitars and basses. Both the Stewmac Nut Slotting Gauges and the LMI String Height Gauge perform exactly as advertised; they let you increase the accuracy, repeatability and quality of your setups. My heartfelt recommendation is that get your hands on one of these gauges for this common and crucial task in the guitar workshop. Your setups and customers will see the difference.